One of the new features included in OBI 11g is the Master-Detail linking feature. The Master-Detail linking allows you to establish a relationship between 2 or more views; one view is called the Master and will drive changes in 1 or more views called detail views. You can think of a Master-Detail relationship in a similar manner that you would when navigating from 1 report to another works, but you do not lose sight of the master view. So, how do we implement a Master-Detail link? We start out by defining an analysis that will be used to create the master view. Here we have created a simple analysis and filtered for Year = 2008. Now we want to configure this analysis so that we can create our master view. We will select the “Per Name Qtr” column as the data driver; so, we open the Column Properties window of this column and move to the Interaction tab. 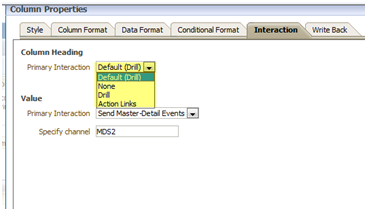 Here we select the “Send Master-Detail Events” under the Value Primary Interaction. Once you select this option a secondary edit box labeled “Specify channel” will be made available. You can enter any unique identifier in this box. For our example, we have entered “MDS2”. Unlike some interaction options like Action Links” which is available on both Column Heading and Value, the Master-Detail option is only available on the Value. This has to do with how a Master-Detail link functions. The value of the cell you click on is passed to the detail view(s); thus, a column heading cannot be used. We now navigate to Results and create the view we want as our Master view. Here we are using a simple tabular view. Notice that our “Per Name Qtr” values do not show the typical hyperlink that you would expect from the time dimension column. Now we need to create a detailed view that will listen to events from our master view. To do this, we will add an additional graphical view from the same analysis. 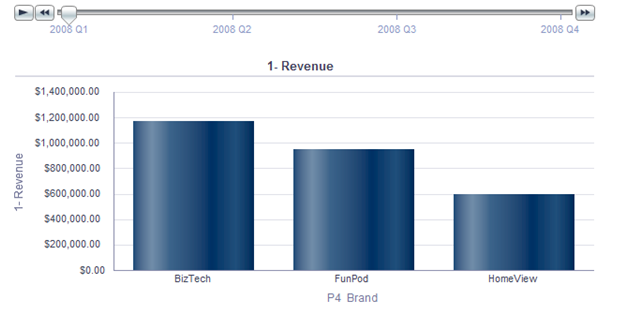 Our graphical view will look at Revenue by Brand with our Quarter values placed into a view slider. With our graphical view in edit mode, we need to open the properties window. One of the properties available to us is the “Listen to Master-Detail Events” checkbox. 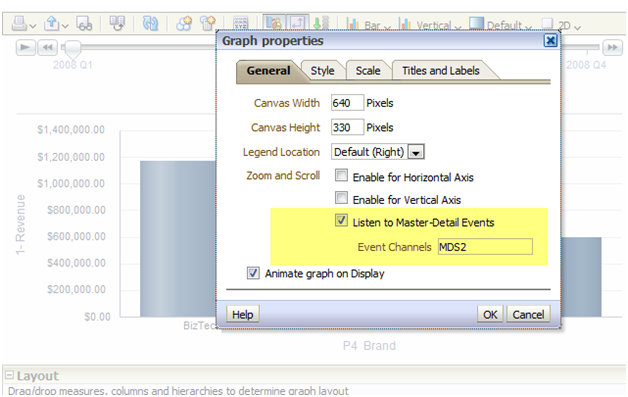 By checking this box, we can define this view to be a detailed view for the event channel we want. 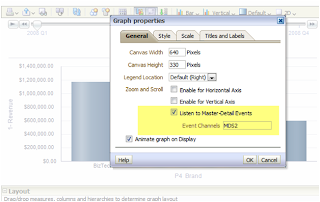 In our case, we will enter the value “MDS2” as our event channel which is the same value we defined on the “Per Name Qtr” column properties which is our data driver on the master view. We want to validate our Master-Detail report is working as expected. We will do this by placing the compound layout on to a dashboard page. I have edited the compound layout so that my views, master and detail, are side-by-side. When you click on a cell under the “Per Name Qtr”; such as, “2008 Q2” on the tabular master view, the secondary detail view (graph) accepts the Qtr value and the slider automatically moves to the selected value. We will continue to explore the Master-Detail link by looking at more advanced features of this link in my next entry. On this holiday week I decided to dedicate this post to giving some thought to the challenges leaders of finance organizations face and to looking at them in terms of coming up with a short list of indicators that can be leveraged as they reflect on the ways to shape their team’s strategy in a way that maximizes their contribution and impact on the company this soon to come new year. To keep things simple and avoid taking too much of your holiday time this post focuses on three dashboard ideas that align values and traits of high performance teams and that are built in response to governance and strategic challenges common to many financial organizations. These dashboards can be easily implemented with Oracle Business Intelligence or other similar reporting tool. My recommendation is to have the first iteration of your dashboard be as simple and concise as possible and build upon it as your needs and processes evolve. One of the organizational values that are hardest to measure is the discipline that your overall organization exhibits when making strategic decisions. Measuring the return on capital allocations is a process common in large conglomerates that isn’t always transparent or free of political maneuvering. Deploying a simple dashboard that tracks the progress of large strategic projects in terms of both schedule and actual versus budgeted costs allows the office of the CFO to educate executives and managers in other areas on financial methodologies such as calculating the Internal Rate of Return (IRR) of a project or estimating the Total Cost of Ownership of a piece of equipment. Having a dashboard with Key Performance Indicators that measure the rate of return, and actual versus projected performance in terms of cost and schedule will help your organization bring more transparency to the process of deciding which projects will be funded and will help your counterparts in other areas of the business in improving their financial decision making skills. One other function that usually resides with the finance organization is the process of closing the books and preparing financial and management reports. This process which is, for the most part, simple and repetitive is implemented and managed very differently from company to company. These differences are often a result of industry specific accounting and differences in management style. The best way to save your staff late nights and weekends while delivering analysis and reports to your management faster might be as unorthodox and simple as breaking your closing process in the different tasks that compose it and tracking the time each of them takes to complete each month. You can start simply by writing the list on a white board and later on make the transition to a dashboard page that can be shared with all of your team. By understanding which components of your closing process take the most effort from your team you gain great visibility and thinker with the processes to shorten your cycle time. There have been corporations that implement daily reconciliation of their accounts therefore gaining the ability to detect unusual account activity much faster than if they had to wait for the bank statements to arrive in the mail. You can use the data in your closing cycle dashboard as a development opportunity for your staff by encouraging them to detect processes that exhibit a lot of variance from month to month and coming up with ways to proactively eliminate the causes of this variance. With the economy signaling it is finally turning around towards recovery and finance and accounting staff job satisfaction at the lowest level in years it is time to identify top performers and give them opportunities to feel challenged and excel. It is in the best interest of finance leaders to create opportunities for their staff to get out of the routine of their day to day work and go work in teams within other functional areas of the organization by providing them with internal consulting on financial management and compliance best practices. This aligns very closely with the first dashboard idea, your staff can provide training and consulting to teams working on strategic projects being tracked on the IRR/Projects dashboard. The value created by these select members of your team can be tracked by the number of projects they are consulting for and the number of training and consulting hours they provide to other areas of your organization. This in turn can be used as a tool in the justification of any proactive compensation activity you might decide to undertake as you try to retain high performing employees in your team. When planning your finance organization’s strategy for the year that is about to begin you can use the dashboard ideas in this article as tools that will allow you to communicate to your staff and to other functional areas and fellow executives what improvement is being made in the internal processes of your area and; most important, how is it that your team can be engaged as a partner in value creation. Please send your feedback and comments to Ignacio.delaTorre@biconsultinggroup.com, I’ll be very interested to hear your opinion and any additional ideas that might be useful to others reading this article. Because relational databases can store several terabytes of data, they offer nearly unlimited scalability. Multidimensional databases, generally smaller than relational databases, offer sophisticated analytic capabilities. By integrating a relational database with an Essbase database, you leverage the scalability of the relational database with the conceptual power of the multidimensional database. By default, when Essbase Studio creates an Essbase outline, it loads all member levels specified in the metaoutline into a multidimensional database. You can, however, set Essbase Studio to build to a specified member level (Hybrid Analysis) or build only to the dimension level (Advanced Relational Access). Building down to a specified level produces a smaller multidimensional database and a smaller Essbase outline. A source relational database can be integrated with an Essbase database by using XOLAP (extended online analytic processing). This is a variation on the role of OLAP in business intelligence. Specifically, XOLAP is an Essbase multidimensional database that stores only the outline metadata and retrieves data from a relational database at query time. XOLAP thus integrates with an Essbase database, leveraging the scalability of the relational database with the more sophisticated analytic capabilities of a multidimensional database. XOLAP (extended online analytic processing) is a variation on the role of OLAP in business intelligence. Specifically, XOLAP is an Essbase multidimensional database that stores only the outline metadata and retrieves data from a relational database at query time. XOLAP thus integrates a source relational database with an Essbase database, leveraging the scalability of the relational database with the more sophisticated analytic capabilities of a multidimensional database. 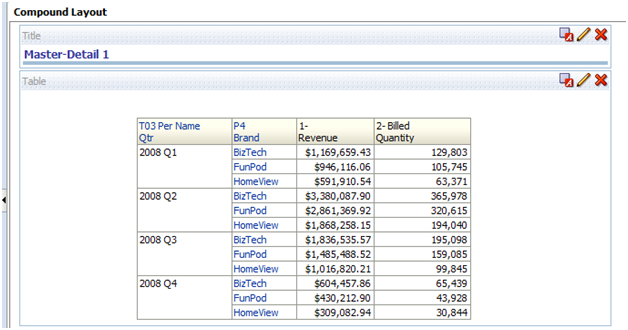 In OLAP, the metadata is located in the Essbase database, and the underlying data is also located in the Essbase database. In XOLAP, the metadata is located in the Essbase database while the underlying data remains in your source relational database. The differences in the locations of the metadata and data are key to understanding how XOLAP can be of benefit because these differences affect the functionality of OLAP and XOLAP. OLAP lends itself to traditional relational data storage and data analysis. XOLAP lends itself to operations supported in mixed or "hybrid" environments such as Hybrid Analysis and Advanced Relational Access (familiar to users of Essbase and Essbase Studio). Many of the basic concepts of Hybrid Analysis and Advanced Relational Access have been folded into the functionality of XOLAP cubes in Oracle Essbase Studio. 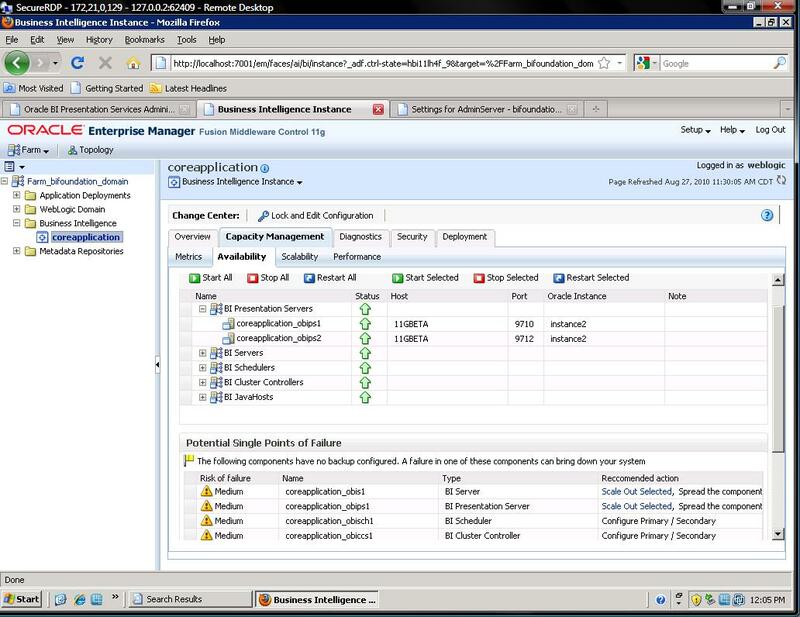 The model is designated as XOLAP-enabled in Essbase Studio. The cube is deployed in Essbase Studio; however, no data is loaded at that time. The Essbase database is queried, using Smart View, Oracle Essbase Visual Explorer, or another reporting tool which can access an Essbase database. Essbase dynamically generates the required SQL to retrieve the data from the source relational database. No editing of an XOLAP cube is allowed. If you wish to modify an outline, you must, instead, create a new outline in Oracle Essbase Studio. XOLAP operations will not automatically incorporate any changes in the structures and the contents of the dimension tables after an outline is created. When derived text measures are used in cube schemas to build an Essbase model, XOLAP is not available for the model. XOLAP can be used only with Aggregate Storage. The database is automatically duplicate-member enabled. XOLAP supports dimensions that do not have a corresponding schema-mapping in the catalog; however, in such dimensions, only one member can be a stored member. Hybrid Analysis eliminates the need to load and store lower-level members and their data within the Essbase database. This feature gives Essbase the ability to operate with almost no practical limitation on outline size and provides for rapid transfer of data between Essbase databases and relational databases. Hybrid Analysis integrates a relational database with an Essbase multidimensional database so that applications and reporting tools can retrieve data directly from both databases. The initial step in setting up XOLAP or Hybrid Analysis is to define the relational database as a XOLAP or Hybrid Analysis relational source. 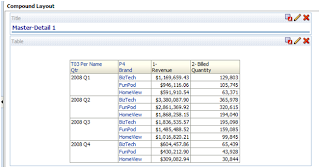 You define the XOLAP or Hybrid Analysis relational source in Essbase Studio. 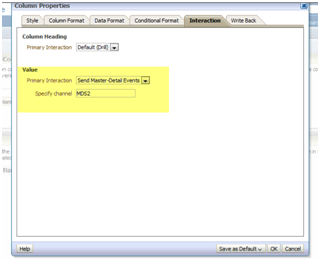 Through Essbase Studio, you first specify the relational data source for the OLAP model. The OLAP model is a schema that you create from tables and columns in the relational database. To build the model, Essbase Studio accesses the star schema of the relational database. Using the model, you define hierarchies and tag levels whose members are to be enabled for Hybrid Analysis. You then build the metaoutline, a template containing the structure and rules for creating the Essbase outline, down to the desired Hybrid Analysis level. The information enabling Hybrid Analysis is stored in the OLAP Metadata Catalog, which describes the nature, source, location, and type of data in the Hybrid Analysis relational source. Next, you perform a member load, which adds dimensions and members to the Essbase outline. At this point XOLAP databases are complete and can queried by a multitude of reporting tolls. For Hybrid Analysis databases, when the member load is complete, you must run a data load to populate the Essbase database with data. Applications and reporting tools, such as spreadsheets and Report Writer interfaces, can retrieve data directly from both databases using the dimension and member structure defined in the outline, Essbase determines the location of a member and then retrieves data from either the Essbase database or the Hybrid Analysis relational source if a Hybrid Analysis database and from the relational data source when a XOLAP model is specified. If the data resides in the Hybrid Analysis relational source, Essbase retrieves it through SQL commands. XOLAP also leverages transactional SQL to access data from the fact table at the time the query is initiated by the end user. Since XOLAP only supports the Aggregate Storage Kernel, it is pertinent to highlight the differences in ASO and BSO. Customer analysis. Data is analyzed from any dimension, and there are potentially millions of customers. Procurement analysis. Many products are tracked across many vendors. Logistics analysis. Near real-time updates of product shipments are provided. Aggregate storage applications, which differ from block storage applications in concept and design, have limitations that do not apply to block storage applications. • Additional restrictions for shared members. • Stored hierarchy dimensions cannot have shared members. Stored hierarchies within a multiple hierarchies dimension can have shared members. o The parents of the member must be label only. No automatic update of values. To update data values, you must execute all necessary calculation scripts. The loading of multiple data sources into aggregate storage databases is managed through temporary data load buffers. When loading data into an aggregate storage database, you can replace the contents of the database or the contents of all incremental data slices in the database. Aggregate storage databases can contain multiple slices of data. Data slices can be merged. Full support for parent-child build method. Duplicate generation (DUPGEN) build method limited to building alternate hierarchies up to generation 2 (DUPGEN2). In a date-time dimension, you can load data into level-0 members using supported date-format strings instead of member names. Date-time dimension type is not supported. Returns values for descendants of the non-level 0 member. Considerations when querying data from a dimension that has multiple hierarchies. Support with the following restriction: queries that contain a relational member and an Essbase member with a formula in the same query are not supported. 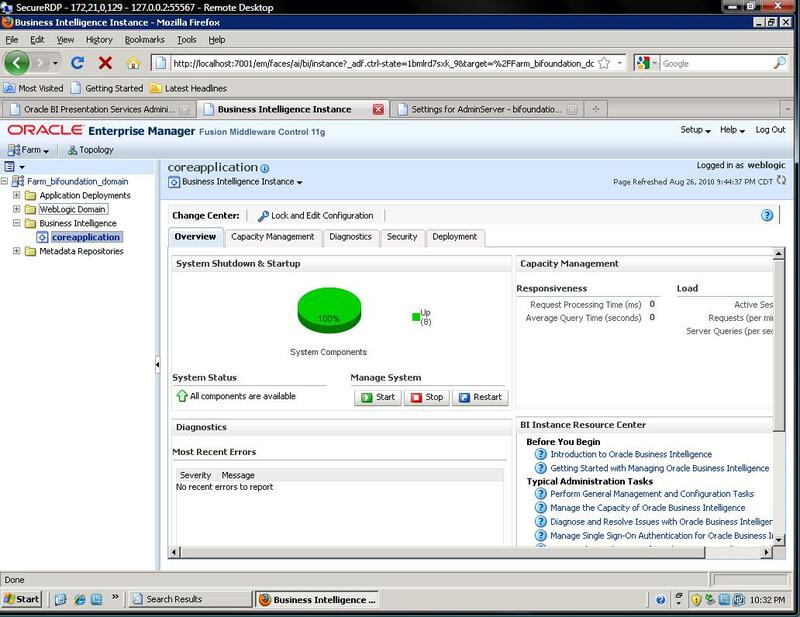 The Fusion Middleware Control EM console has five tabs to manage the application. 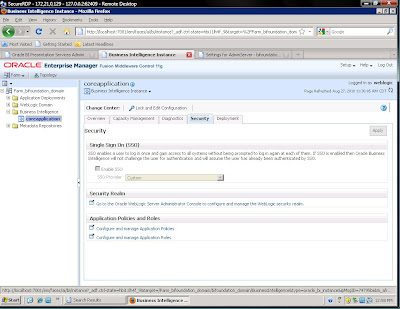 From the domain tree, expand Business Intelligence and click coreapplication as shown below. This view shows system status, and allows you to start/stop the system. The other tabs allow you to further configure the application. -Metrics: This gives metrics on request response time, load and query errors. You once might have looked at Usage Tracking for this information. -Availability: Shows current availability of all components, allowing you to start/stop them. Also includes 'Point of Failure' analysis which shows areas in the infrastructure likely to fail when a hardware/software failure occurs. -Scalability: This tab lets you enable Verticle Clustering, increasing the amount of instances of OBI on a server. -Performance: Used for cache management, including settings that would have been set in NQSConfig.ini in 10g. It manages user query response time and max rows returned, settings that were set in InstanceConfig.xml. This view has 2 tabs. One for server log messages, and the other for log file settings. These used to be kept in the RPD and the NQSServer.log. This view allows you to enable SSO. 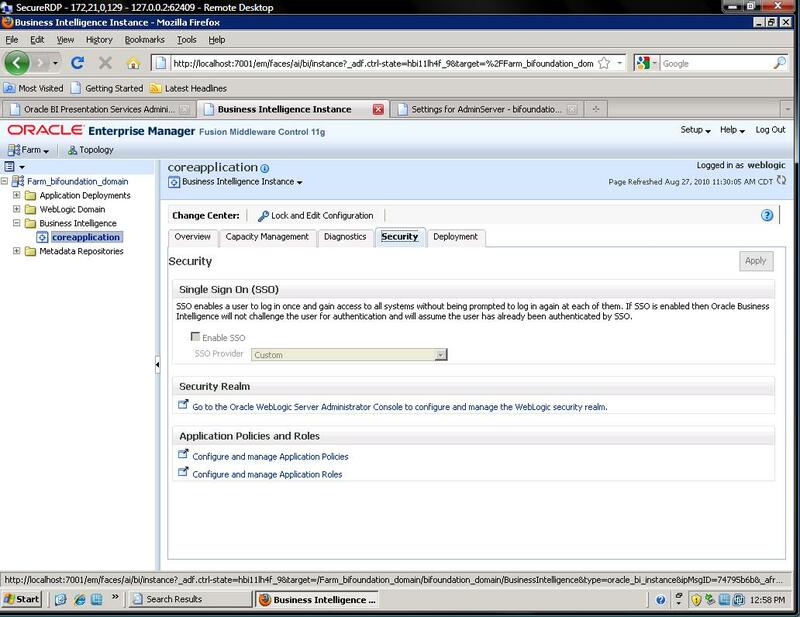 Also links to Weblogic Admin Console Security realm to manage Weblogic security. This section is for managing the deployment of various aspects of OBI 11G. 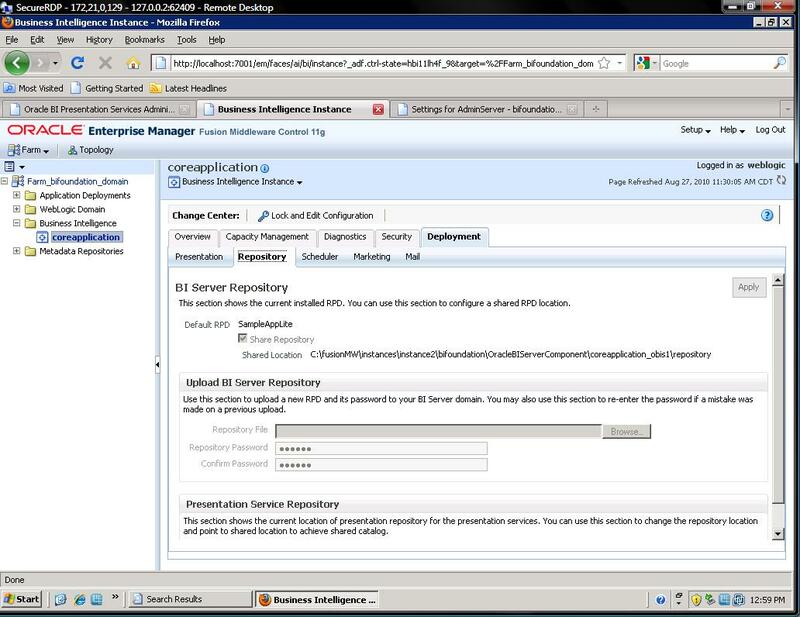 -Presentation: Contains a few settings for Dashboard and Analysis defaults. These used to be managed on a less global scale through Manage Privileges. -Repository: This is where the RPD and Presentation Services are managed, and shared between servers for horizontal clustering. Working with OBIEE 11g on Oracle Enterprise Linux (OEL), with or without the Unbreakable Kernel, one will need to open up several trusted ports as the firewall is turned on by default. Clearly, the best practice is too keep the firewall in-tact and enabled but for extra ports that are needed to access the OBI server environment. Configuring such access is straightforward. The video below takes an informal look at accomplishing opening ports using the OEL graphical user interface. This approach is great for a development or test environment but it is not recommended for a production environment. This video is part of a series of video blog posts on installing and configuring OBIEE 11g. 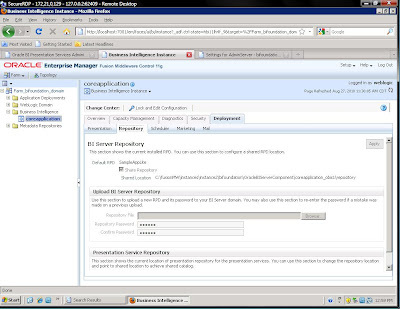 After installing the OBI 11g client tools each OBI developer or administrator will need to access the Oracle BI RPD using the OBI Administration Tool. 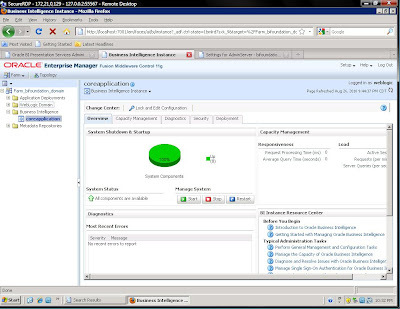 The Administration Tool is the GUI that connects to the Oracle BI Server RPD in Online mode (or on the network in offline mode) allowing development and administration functionality of the RPD. 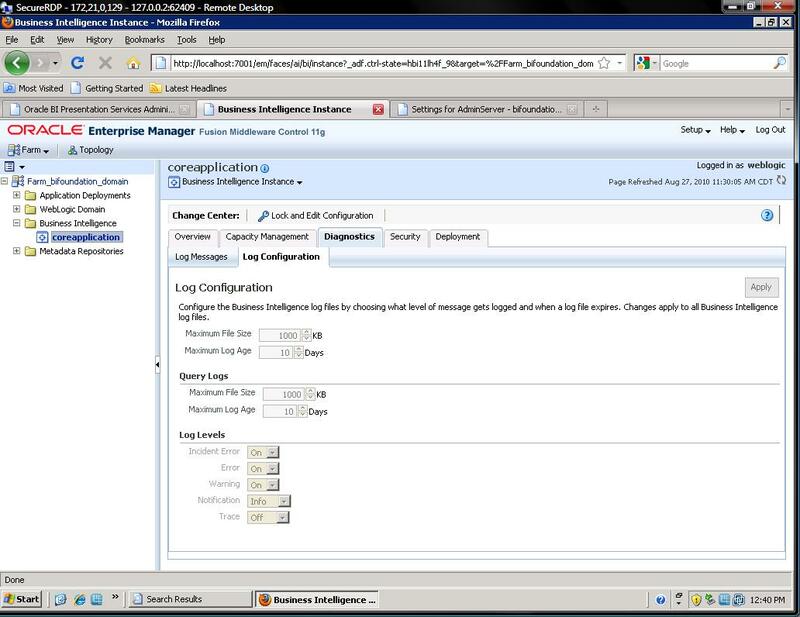 The informal video below highlights the process in which to create an ODBC data source connection to the Oracle BI server and test that the connectivity is working. This video how-to makes the assumption that the client workstation already has the OBI 11g binaries installed on the machine from any of the install options via the OBI11g installer. This video is part of a series of videos on OBI 11g installation and configuration. Oracle tends to work hard to ensure that best practices are adhered to when working with their products. They even go as far to offer certifications which acknowledge one's ability to demonstrate product knowledge and acuity for implementing, developing, etc. with Oracle products. The release of OBIEE 11g is no exception, and Oracle has recently released the OBI 11g Certification Exam for those so inclined and ready to be stamped as an OBI 11g guru. This certification holds some similar exam topics to that of its predecessor certification exam for the 10.1.3.x OBI version. But clearly with OBI 11g there are many new areas on which to be tested. Reading over the OBI 11g Exam certification topics one can get a good feel for what Oracle thinks are "must have" areas within the new application to focus on. Even if not taking the exam, learning these topics should provide an administrator, developer, or super-user with keen insight to working with and implementing OBI 11g. In conclusion, I have always been a fan of official certifications as they show that one took the initiative to learn the information, was grilled on that information via examination, and knew the material well enough to achieve certification status. To me, this is only one or two steps below taking the time to write a book on the topic in question - guru status. Do you think Oracle certifications are worthwhile? How has an Oracle certification the helped you in the past? Should Oracle offer a public OBI 11g certification?